It was 1947. Miss Kwa Geok Choo, 27, one of Malaya's top brains, was just two months into law school at Cambridge University when the Christmas holiday started. The plan was for her and boyfriend, Lee Kuan Yew, 24, to spend some weeks in Stratford-on-Avon and visit the theatre famed for William Shakespeare's plays. What no one else knew was that the couple was heading to the quaint English town with a newly-bought platinum ring - to be secretly married. It would stay a secret between them for the next 51 years, even after they officially tied the knot here in 1950. It also marked the start of a union ahead of its time: That between a man and a woman who saw each other as intellectual equals and forged an uncommon partnership in nation-building. On Saturday, Madam Kwa - soulmate of Singapore's first Prime Minister and mother to its third - died at the age of 89. "Choo", as Mr Lee, 87, affectionately called her, was his "wife and partner". Just how significantly she filled that latter role, however, was not well known to the public for years due to the low profile she deliberately kept - until the 1998 release of Mr Lee's memoirs, The Singapore Story, published by Singapore Press Holdings and Times Editions. It was then that her understated influence on the Singapore Story first emerged. Never-before-revealed material showed that during the drafting of Singapore's agreement to separate from Malaysia in 1965, it was Mrs Lee, a conveyancing lawyer, who wrote up the bilateral contract concerning water supply. Mr Lee had wanted the water agreements with Johor to be included in the Separation Agreement. He said in his memoirs: "I was too hard-pressed, and told Choo, who was a good conveyancing lawyer, to find a neat way to achieve this." The paragraphs drafted by Mrs Lee became part of the Malaysian Constitution, guaranteeing Singapore's water supply from Johor. A founding member of the People's Action Party, Mrs Lee delivered her first and only party political broadcast during the 1959 general election, urging women to vote for the party. She also acted as her husband's intermediary in his dealings with the British governor and a plenipotentiary from the Malayan Communist Party. It was also she who had been proof-reading, even correcting, Mr Lee's speeches since 1950. Naturally, Mrs Lee helped during the three-year production of the 680-page memoirs, staying up with him into the wee hours of the morning to review the drafts or simply to keep him company. She was "one powerful critic and helper", demanding "precise, clear and unambiguous language", Mr Lee wrote in the preface of the book, which was dedicated to her. "Choo was a tower of strength, giving me constant emotional and intellectual support". The capable Peranakan woman also provided what Mr Lee once dubbed his "insurance policy" that freed him to play his role in newly-independent Singapore: A wife who could be a sole breadwinner and raise their three young children at the same time. When he became Prime Minister in 1959, he left the management of their law firm, Lee and Lee, in the hands of his wife and his younger brother, the late Mr Dennis Lee Kim Yew. The trio had set up the business in 1955. "There is no doubt she must have been of great help and comfort to him in his stressful but successful political career. If I may say so, Mrs Lee has been working in tandem with (him) for the good of Singapore," the late Mr Lim Kim San, a former Cabinet Minister, said in 2003. While her knowledge of political affairs was not on par with that of her husband, according to the latter, he valued her spot-on gut feel about people's characters. This, Mr Lee noted in 2004, was a trait inherited by their eldest child, current Prime Minister Lee Hsien Loong: "He picked up from me a certain way of thinking, certain logic, certain cut of mind. He has got from his mother a facility with words, and a certain intuition." That intuition - and her wit - was evident on a September night in 1970 in Moscow where Mr and Mrs Lee, along with Foreign Minister S Rajaratnam, were invited to visit by then Prime Minister of the Soviet Union, Mr Aleksei Nikolayevich Kosygin. Staying at the guest dacha, the couple suspected their rooms were bugged, Mr Lee wrote in the second volume of his memoirs From Third World to First published by Singapore Press Holdings and Times Editions. And Mrs Lee remarked: "Strange, they paid so much attention to me. They must think I have a great deal of influence over you. They gave very little attention to Raja." The next day, Mr Lee recounted, Mr Rajaratnam received much more attention than his wife from their Russian hosts. Mr Lee added: "She has a keen intuition when judging people. While I make up my mind more on analysis and reason, she decides more on 'feel' and has an uncanny knack of sensing the real feelings and positions of a person behind the smiles and the friendly words. She was often right about who not to trust, although she could not quite explain why - maybe it was the expression on a person's face, the way he smiled, the look in his eyes or body language." Mrs Lee's intuition was proven correct on several occasions, including the failed merger between Singapore and Malaysia. Said Mr Lee: "She did tell me that she didn't think Malaysia would work. She didn't think it would work because, she said: 'You know the way they do things and we'll never change them'." Then, there was her resilience. Within two months of the severe stroke in London in 2003, the octogenarian was back to most of her routine activities and appearing by her husband's side at public events. As she had always done since their children got older, she continued to accompany him on his trips abroad. This included a three-nation trip to the Middle East in March 2007. Their loving relationship, when unveiled in glimpses through Mr Lee's memoirs, mesmerised the public. Two incidents stood out. One was their secret marriage. The second concerned a bold request made a year earlier, during a New Year's Eve party in 1946, before Mr Lee left for England. By then, the two Raffles College students had been meeting regularly at the home of Mr Lee's schoolmate, Miss Kwa's brother-in-law - the two men had a gum-making venture going. In 1944, Mr Lee first asked her out on his 21st birthday for a dinner at a Chinese restaurant at the Great World, an amusement park. Mr Lee said in his memoirs: "True, she was escorted by her brother-in-law, but in the Singapore of that era, if a girl accepted an invitation to a young man's 21st birthday dinner, it was an event not without significance." Even in the midst of the Japanese Occupation of Malaya, those courtship days, Mr Lee recalled, were the "happiest" of his life. Hence, even though the ambitious young man was set on leaving for England to read law after the war ended, he wanted to know if she would make a long-term commitment. The incident, recorded in Mr Lee's memoirs, fired the imagination of certain media agencies that added frills such as a romantic "balcony" scene. Exactly, in fact, the kind of "big fuss" Mrs Lee in 1998 told an interviewer she feared would be made over revelations of their early relationship. "That would give me goose pimples," she said, confessing her initial reluctance to having their secret marriage written about in her husband's memoirs. Their relationship, though loving, was not the sentimental sort. "Neither of us would care for candle-lit dinners," she said in another rare interview. Mr Lee once summed up a life partner thus: "You either have the Western view: You marry the woman you love. Or the Eastern view: You love the woman you marry. I tried to match both and I think it wasn't a bad choice." 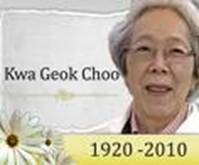 Like the hybrid, white orchid that was one of only two things the intensely private woman would give her name to - the other was a scholarship for law students - Madam Kwa Geok Choo was of a rare breed.